The Viscardi Center was the stage for last night’s debate between Republican New York State Senator Jack Martins and Democrat and former Nassau County Executive Tom Suozzi for the Congressional District 3 seat being vacated by Congressman Steve Israel. 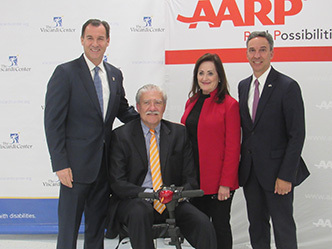 The debate, sponsored by The Viscardi Center and AARP, drew close to two hundred residents from the community, primarily seniors and people with disabilities. Beth Finkel, AARP New York State Director, moderated the evening’s discussion which focused on topics such as Social Security, employment opportunities for people with disabilities, support for caregivers and fair drug pricing. Founded by Dr. Henry Viscardi, Jr., who served as disability advisor to eight U.S. Presidents and became one of the world’s leading advocates, The Viscardi Center educates, employs and empowers people with disabilities. It provides Kindergarten through High School education (up to age 21), school-to-work youth transition services, vocational training, career counseling and employment placement, assistive technology, and adapted driver education to children, adolescents and adults with a wide variety of disabilities. The Center also assists businesses in diversifying their workforces, as well as developing and advancing disability inclusive cultures in their workplaces.